Muttaburrasaurus was a herbivore (plant-eater) that lived in Australia during the Cretaceous period, about 100 to 98 million years. It is currently the best known Australian dinosaur from fossil remains. Muttaburrasaurus is believed to be related to Iguanodon and Camptosaurus. It could work on two legs (bipedally), or four legs (quadrupedally), and was equipped with powerful teeth that could have sheered through cycads and other tough vegetation. Like Iguanodon, it had a spike on its thumb, in the case of Muttaburrasaurus this spike was about 6 inches (15 centimeters) long. Muttaburrasaurus also had an enlarged upward pointing muzzle that seems to have been hollow and may have been used for making calls to other members of the species. MUttaburrasaurus was about 23 to 30 feet (7 to 9 meters) long, and probably weighed between 1 and 4 tons. Australian Dinosaurs - Muttaburrasaurus lived in Australia. Muttaburrasaurus was a genus of dinosaur. "Muttaburrasaurus"Muttaburra lizard" - it is named after an area in Queensland, Australia. Muttaburrasaurus was a member of the Ornithischia ("bird-hipped") order of dinosaurs. What this means, is that although Muttaburrasaurus was not closely related to birds, it did have similarly shaped pelvic bones. Muttaburrasaurus lived between about 100 million years ago and 98 million years ago, during the Cretaceous period. Muttaburrasaurus was a herbivore (plant-eater). Muttaburrasaurus was about 23 to 30 feet (7 to 9 meters) long. Muttaburrasaurus probably weighed somewhere between 1 and 4 tons. This series introduces young students to the world of paleontology. Bird-footed dinosaurs like Iguanodon were plant-eaters that could walk on two legs. Many of the dinosaurs in this group could run away from hungry predators. Others traveled in large herds to stay safe. Bold, full-color illustrations, easy-to-read charts and maps, and interesting facts take readers back to a time when bird-footed dinosaurs walked the earth. This book supports common core standards. 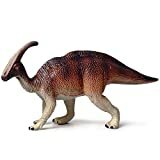 CollectA's replica of the Muttaburrasaurus is lifelike and detailed, down to the bony bulb on its snout and its unusual feet. The Muttaburrasaurus was discovered in 1963, near Queensland, Australia. The 26-foot-long dinosaur lived approximately 112 - 98.6 million years ago. The creature is depicted in motion, turning its head as if to see what's coming up from behind. 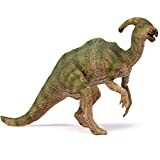 The beautifully sculpted, collectible figure from our Prehistoric Life Collection measures 5.5''L x 2''H. Each figure in our Prehistoric Life Collection has been approved by archeologist Anthony Beeson, a well-respected expert in paleoimagery. All CollectA models are individually hand crafted to the highest standards and made with the finest and safest phthalate-free, lead-free materials. Create a natural world in miniature with high quality toy replicas from CollectA. Our mission is to educate collectors and to provide the greatest opportunity for creative play. Size:15cm X 3.8cm Diet:Herbivorous Period:Lower Cretaceous Meaning:Muttaburra Lizard Fun Facts: Muttaburrasaurus had a upward pointing bulge on its snout that may have held an inflatable sac for signalling or to improve its sense of smell.